My words have abandoned me—book writing burnout, I suppose. I know better than to try and force it. My writing muse needs to rest and so I'm giving her a much needed sabbatical. I've turned my creativity toward sewing: one of my first loves. 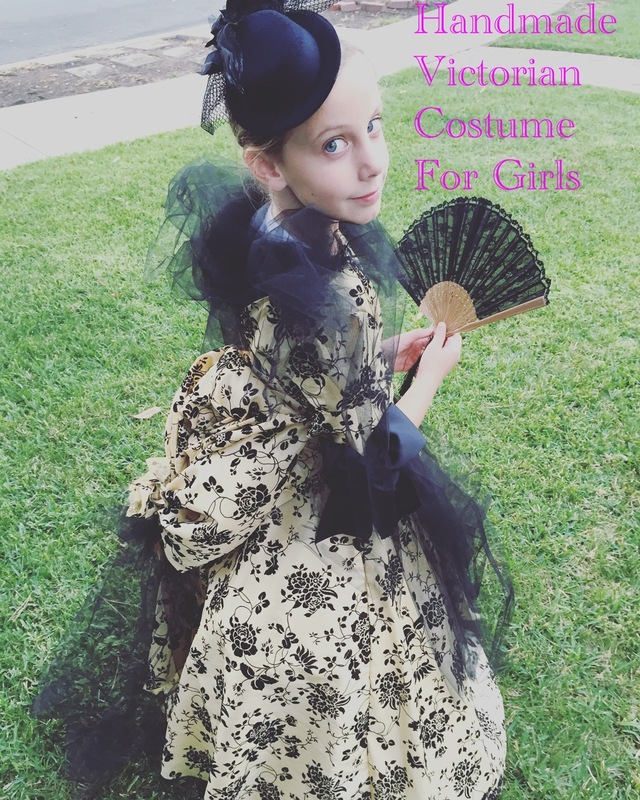 I decided to make a "Victorian Lady" Halloween costume for Jasiel. I learned how to sew in 7th grade on my mother's old sewing machine from the 1970's. But before that, I'd always loved dresses—especially period costumes. One of my favorite pastimes as a child was playing dress up and playing with paper dolls. I had a paper doll book from the Smithsonian Museum which showcased dress styles from the 1800's. I adored it. I practiced drawing the costumes I saw in the book. I've always been fascinated by clothing rituals. In college, I wrote a huge semester research paper on the intricacies of Victorian and Romantic-era dresses and how it related to the status, wealth and ownership of women. Aside from the intellectual and feminist implications of female dress, I've always maintained a deep admiration for the artistry of handmade garments. About seven years ago, I purchased a simple flower girl dress pattern. My idea was to sew up a nice special-occasion dress for my oldest daughter, Jewel. She was 9. Well, I only got as far as cutting out the fabric for the skirt. My twins were eleven months old. What was I thinking trying to sew when I had baby twins? HA. Fast forward to last week. I took out my sewing things—just for fun. I needed to PLAY. I came upon the long neglected, unfinished dress. And I had an idea. Why not tweak the pattern and create a Halloween costume for Jasiel? My sewing philosophy: keep it simple and PLAY. Believe it or not, this costume was incredibly easy to sew. It LOOKS complicated, but it's not. Anyone with basic sewing skills can make this costume. This is the pattern I used: McCall's MP295 (it looks like McCall's no longer carries this pattern). But that's ok. All you really need is a simple, straightforward "special occasion" dress pattern. I would go with something like this from Simplicity. Now, let me explain my process. I always look for ways to make things simpler. In my opinion, dress patterns are ridiculously difficult to understand. All the symbols, dots, arrows, wrong-side/right-side, double-thickness fold...ACK! It's just too much. It kills the joy of creating! Remember my philosophy? KEEP IT SIMPLE AND PLAY! Trick #1: Sew the skirt first! I always cut out the skirt and sew up the side hems because BOOM! Hardly any time at all and I feel like I've accomplished something. Then I cut out the remaining fabric pieces and begin work on the bodice. Trick #2: Play with the sleeves! For a costume piece, nobody is gonna see the inside of the sleeves, so instead of lining the sleeves, I used the lining (which is just a second piece of sleeve fabric) and added it to the cap sleeve. Voila! A fancier, "more Victorian" 3/4 length sleeve. To make it even fancier, I sewed PRE-MADE hair bows to the bottom of the sleeves (see above pictures). Trick #3: Tulle covers a multitude of sins. Got a messy seam? Cover it with an explosion of tulle. Also, tulle is amazing. It adds mystery and whimsy. I tore apart one of Jewel's old dance costumes and bunched it up on one of the shoulders as a kind of flowing, side-cap (note in the pictures, I also used it as a collar/shawl around her shoulders). I hand-stitched the tulle to the shoulder and fancied it up with a sequined, flower hair clip. Trick #4: Why use zippers when you can just use velcro? Zippers are annoying. For me, at least. I mean, sure. I'll USE a zipper if I have to. But in a costume, we are PLAYING. So, instead of a zipper in the back of the dress, I just stitched in a long strip of velcro. Trick #5: DETACHABLE bustle, yo. Nobody has time to sew a bustle ONTO the costume. I used a large square of fabric, stuffed it with a whole bunch of excess tulle (TULLE IS AMAZING! ), gathered the fabric toward the center and used a rubber band to secure it. Above the rubber band, I created draping and folds in the fabric, securing with pins and later running a straight stitch over a few places to keep it together. Below the rubber band/fabric knot I folded a separate rectangle of fabric to create the bustle "tail." I sewed the top of the bustle to a half-circle of fabric that I'd made stiffer using iron-on interfacing. Then I attached the half-circle to a sash that could be tied around the waist. 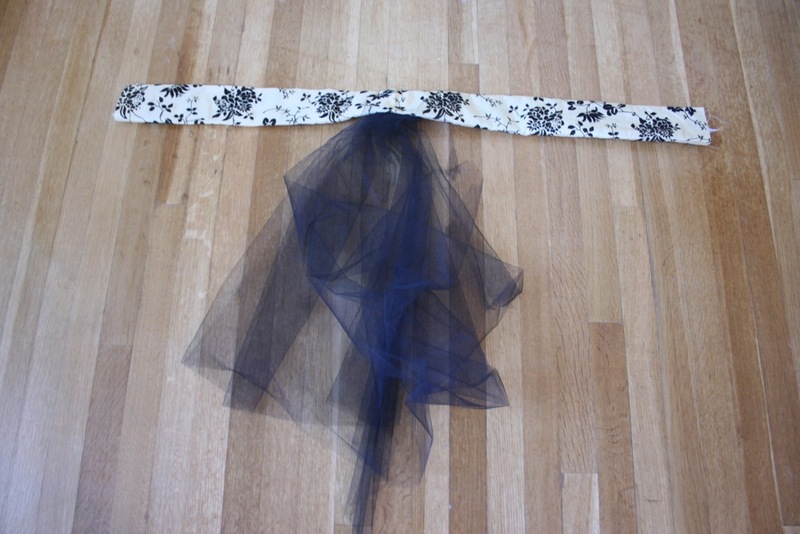 Trick #6: A pretty sash makes everything pretty. I folded a long piece of rectangular fabric in half and attached a pouf of tulle on the inside. This sash sits on top of the bustle sash (to hide the bustle sash) and is attached UNDER the bustle in the back. I purchased a "mini top hat" and black lace fan from Amazon. To make the dress pouf out, I used an old "southern belle" costume. I cut off the bodice and ruffles until all that was left was the wire hoop skirt which Jasiel wore under her costume. I had SO MUCH fun putting this costume together. I kept coming up with new ideas and just PLAYING as I went along. When we took some pictures, Jasiel really got into it—as you can tell from her facial expression in this picture. HA. It was a blast. I can't wait to sew something else!! I'm no sewing expert, but if you have any questions about this costume I'd be happy to answer them! Thanks for reading! XO. EE.